Looking for a winter themed or snowflake craft for your children’s church or Sunday School class? 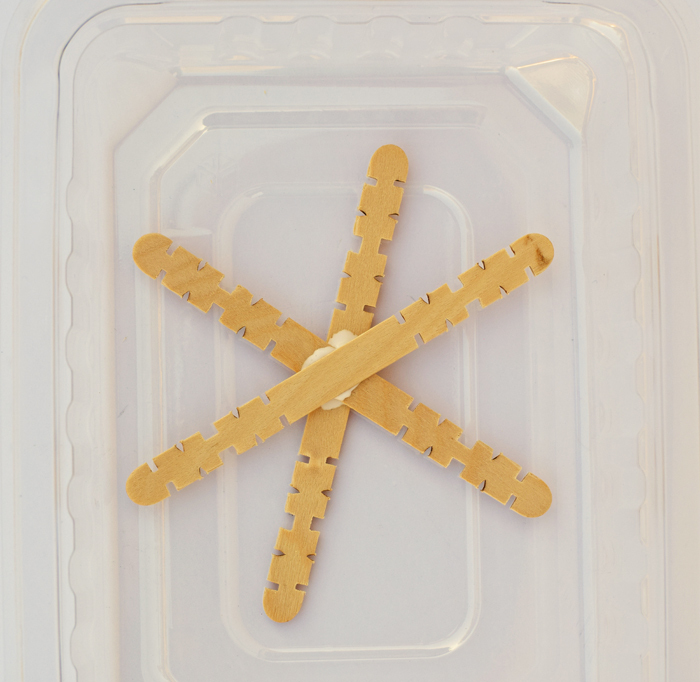 Try this craft! 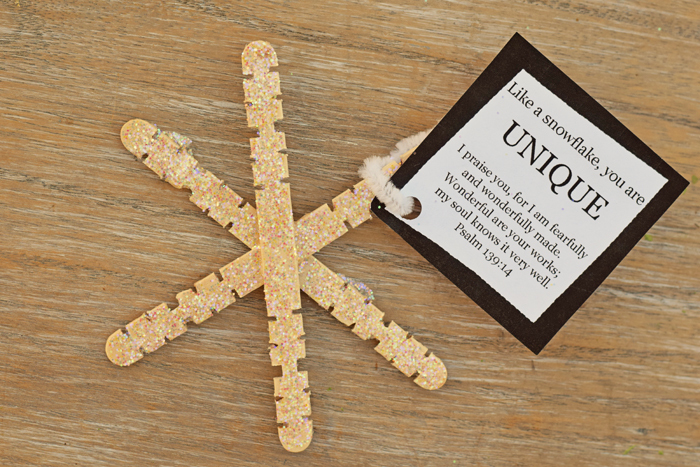 This Fearfully and Wonderfully Made Snowflake Craft post may contain affiliate links. In a recent reader Facebook survey, readers chimed in on what crafts that they would like to see most on the blog in 2017. The choices of “General Kid Crafts” and “Bible Themed Kid Crafts” received a close amount of the same number of votes. I’ve decided to try out, at least for a few crafts, ideas that can fall into either category with minor changes, like today’s Snowflake Kid’s Craft! 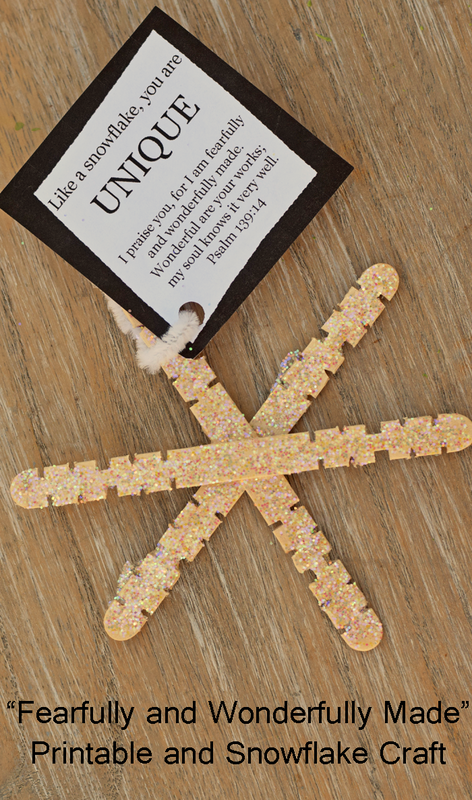 Use today’s craft for general winter or snowflake crafts, or combine it with the free printable and a lesson on Psalm 139:14 to transform it into a Bible themed craft. Pair this with a lesson that you may already have, or you may expand on this lesson based on the age of the children to which you are teaching. Lesson: We often learn in school that snowflakes are unique. What’s unique? Merriam-Webster’s dictionary defines the word as “being the only one; being without a like or an equal.” Like a snowflake, God made all of us unique. There never has been nor will there ever be anyone exactly like you! He made you unique and special. 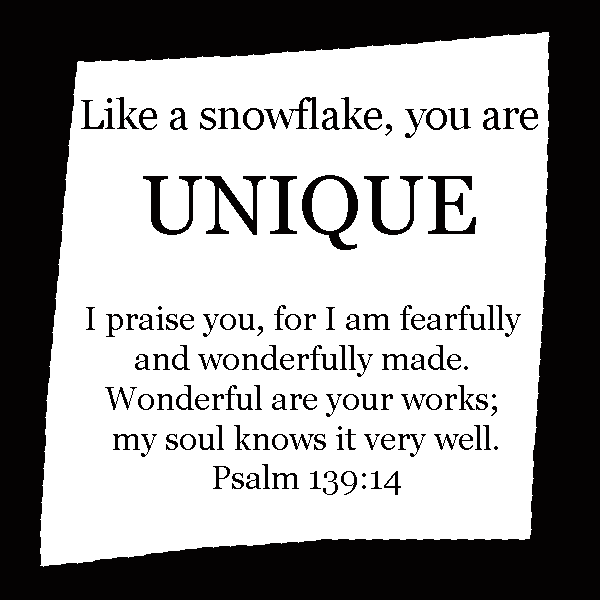 Psalm 139:14 says, “I praise you because I am fearfully and wonderfully made; your works are wonderful, I know that full well.” Create this snowflake craft and think of how special you are to God each time that you look at it! Place the plastic container or paper plate on the table. For home use, I like to use plastic containers that I can clean out and reuse. However, for Sunday School or Children’s Church purposes, a paper plate may be better for easier clean up. 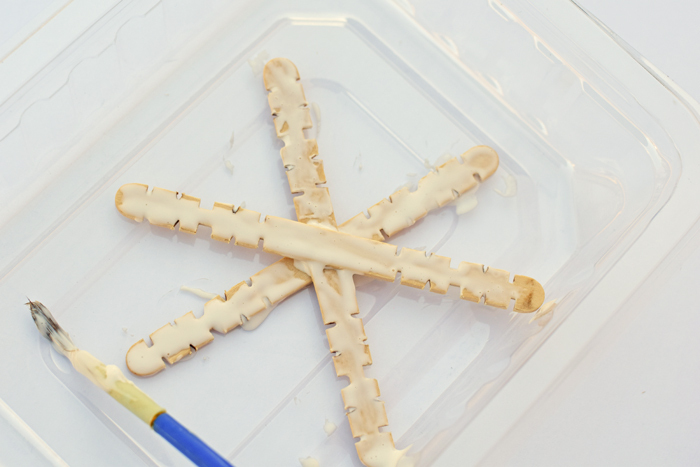 Cross two sticks and secure them with craft glue. Place another stick over these and glue. Let the glue dry completely. 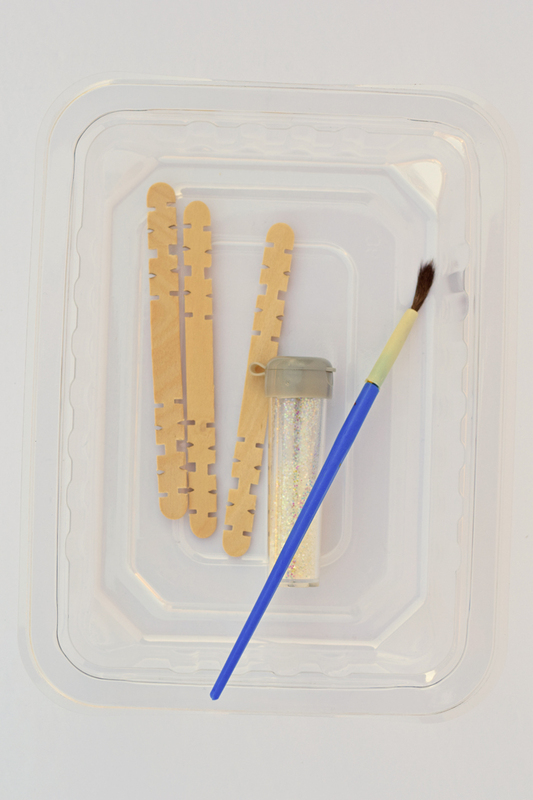 Use a paintbrush to Mod Podge to the craft sticks. 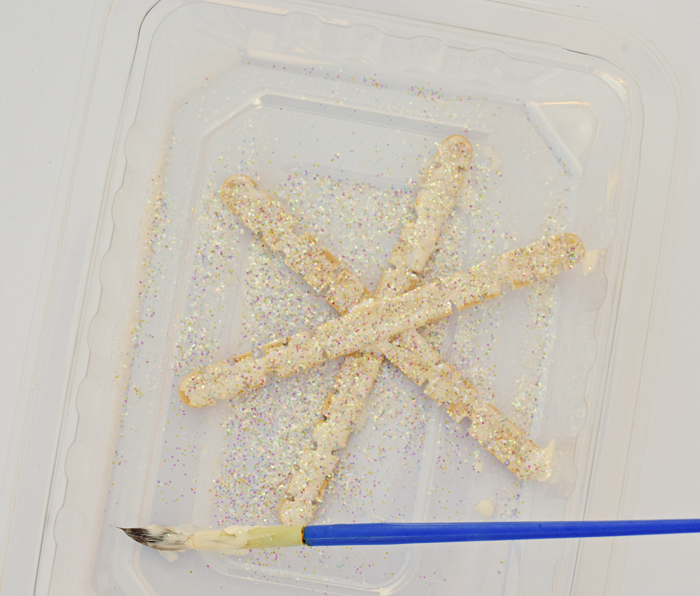 Sprinkle glitter over the Mod Podge and let it dry. 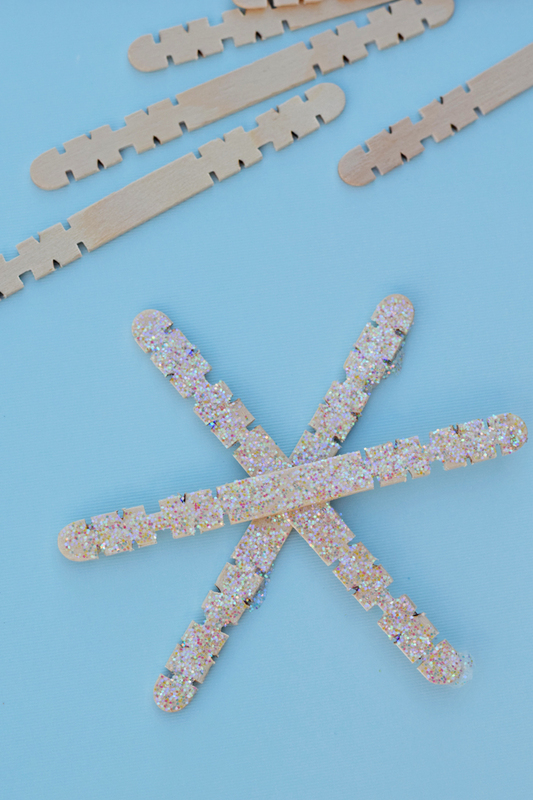 These Craft Stick Snowflakes are a fun kid’s craft for home. But add this printable, and they go great with a Children’s Church or Sunday School lesson. To grab the printable, right click the image below to save it to your computer. Print it out on your printer. I am unable to print out the quote for my class. how may i get this printable? I’d appreciate your help. thanks! Hi, I answered your email. Thanks for checking!